Is your relationship with God stuck in neutral? Are you not hearing His voice? Has your spiritual growth stalled? If so, then you are not alone; it seems that everyone gets stuck along the way somewhere and that’s what makes this book a must read. I received a free copy of this book from Bethany House in exchange for my review. At first, I thought it’d be a fast read through, I’d give my opinion of whether I liked it or not and move forward to my next review. However, this book grabbed me from the first page; so, instead of a quick read, I found myself digging in and actually engaging the study. 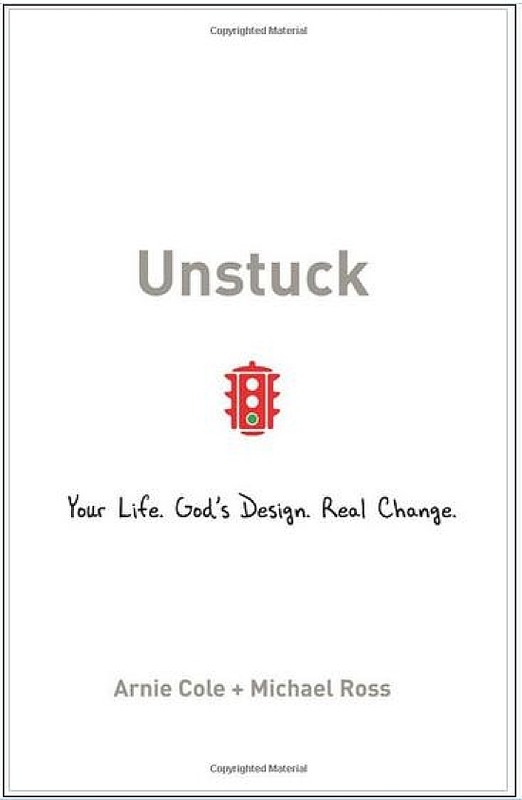 Unstuck is about helping people to draw in closer to God through emerging themselves in the Bible. Emerging in the Word is more than a casual reading of scripture here or there. Without sounding preachy, Unstuck takes a closer look at why people get stuck. Authors Arnie Cole & Michael Ross from Back to the Bible, include testimonies of other people’s life-stuck situations, along with sharing their own stories. They encourage people to read God’s word for themselves and not rely on someone else’s opinion. Through extensive surveys, Arnie and Michael have found that Christians who interact with God through the Bible at least four times per week reap significant spiritual benefits. This book inspires a relational fellowship with God that is not filled with formulas or religious rules. It helps people develop a two-way communication with the Father. Accordingly, this study isn’t about memorizing scripture but actually taking it in, metabolizing it, and allowing God’s Word to take root. Unstuck has changed the way I communicate with God; it has helped strengthen my faith and I’m excited to read His Word again. I’d recommend that readers have their Bibles handy as each chapter has verses to look-up and a thought provoking question to ponder. This book earns five stars and it is a welcome addition to my reference library. Visit their website at http://www.unstuck.gotandem.com/ for even more tools to help you become Unstuck in your daily walk with God. Your recommendation of this book is something I will definitely take under consideration and look forward to checking this book out for myself. Thanks for sharing this review with me. The very first paragraph got me. When you stated that the book grabbed you, I found myself thinking I should read it. Your statements just draw people in. The author should be paying you!!! Great job Laura, I am so proud!!!! Laura you have a very special talent for writing! After reading this review, I know it will be in my Amazon.com shopping cart soon! Thank you for stopping by my blog. This book made me want to dig in deeper into God’s word. I love to write and now I want to share it for His glory. Intrigued, captivated, interested…anything to get me closer to God. I already printed out the first 10 days of the 45 day challenge. You are a great inspiration LB. Oh good Bonnie! It’s great to get into God’s word and the more we’re into it, the more we hear His voice. Definitely sounds like a book I want to get into. I think it would make a good Bible study! Yes, it’d make an excellent bible study. This sounds like a book that I want to read, and also I NEED to read! Thanks for your review! Yes, it’s a good book and study.